HI-STEM, the Heidelberg Institute for Stem Cell Technology and Experimental Medicine at the German Cancer Research Center (DKFZ), is looking back on ten successful years. In numerous types of cancer, HI-STEM researchers have been able to show the role of stem cells in the development, spread and therapy resistance of malignant tumors. The results show new approaches towards treating the threatening diseases more specifically and more effectively in the future. HI-STEM, a nonprofit institute, will now receive support amounting to €7.5 million from the Dietmar Hopp Foundation for the third consecutive five-year funding period. In addition, the Dietmar Hopp Foundation has agreed to support another two research projects at HI-STEM with funds amounting to €2.25 million. Stem cells are the basis for the continuous regeneration of all tissues in our body - but they can also play a disastrous role in the development of cancer. "Most cancers originate from stem cells that have undergone pathogenic changes," says Andreas Trumpp, Managing Director of HI-STEM, who is also heading the Division of Stem Cells and Cancer at the German Cancer Research Center (DKFZ) in Heidelberg. "These so-called cancer stem cells are also responsible when the cancer spreads in the body and is resistant to conventional therapies. Therefore, the focus of our research is on cancer stem cells." In 2008, the Dietmar Hopp Foundation and the DKFZ had teamed up to found HI-STEM as a public-private partnership. Its aim is to pursue internationally leading-edge basic research on stem cells as a basis for developing new approaches in the diagnosis and therapy of cancer. "The research results attained by Andreas Trumpp and his colleagues confirm the important role played by stem cells in numerous cancer types," says founder Dietmar Hopp. "They show a wide variety of new ways to improve the treatment of cancer in the future. The upcoming funding period will give the researchers the opportunity to continue their work with the goal of advancing the new findings into innovative medical concepts." "We are very much obliged to the Dietmar Hopp Foundation for its extraordinary commitment to HI-STEM," said Michael Baumann, DKFZ Chairman and Scientific Director. "HI-STEM is an outstanding example showing how excellent basic research in biology produces highly relevant results which have the potential to enhance the diagnosis and therapy of cancer." For the years 2018-2023, the Dietmar Hopp Foundation will prolong its support of HI-STEM by contributing another €7.5 million. The DKFZ, as the second shareholder, is contributing an equal amount and providing state-of-the-art instruments, laboratories and infrastructure for the innovative institute. Including the newly agreed funding period, the Dietmar Hopp Foundation thus will have contributed or has agreed to contribute, respectively, a total sum amounting to €22.5 million for HI-STEM by the end of 2023. During the first two funding periods, the currently six HI-STEM research groups achieved numerous spectacular and much appraised results published in international specialist journals such as Nature, Science, and Cell. For example, researchers led by Marieke Essers unraveled how blood stem cells escape from the effects of therapy by remaining in a kind of dormancy - and how they can be awakened using endogenous chemical messengers, making them susceptible to drugs again. In addition, the researchers found that vitamin A controls the dormancy of blood stem cells and that a specific metabolic pathway plays a central role for the function of leukemia stem cells. Old age is the prime risk factor for cancer. This makes the findings of the HI-STEM research group led by Michael Milsom particularly relevant. Milsom, a stem cell expert, showed that throughout lifetime many small blood losses or infections keep forcing the blood stem cells to leave their dormant state and stimulate them to divide, which can lead to DNA defects each time. Fortunately, stem cells are equipped with repair systems which fix most of this DNA damage. However, if cells are chronically exposed to these stress factors, this puts too much stress on the repair system. As a result, with increasing age the stem cells accumulate more and more DNA damage and ultimately fail and die. HI-STEM researcher Milsom thus explains why with age our tissues and organs gradually lose their capacity to regenerate. In addition, DNA defects can cause the stem cells to be transformed into seeds of cancer. The researchers in the team of Andreas Trumpp achieved a huge breakthrough when they discovered the stem cells that are responsible for the spread of breast cancer in the body. The HI-STEM investigators have now been the first worldwide to cultivate these breast cancer cells from the blood of patients in the Petri dish. This could make it possible, for the first time, to isolate living cancer cells directly and non-invasively from patients at various times in the course of the disease, for example in order to individually examine the development of resistance. The researchers hope that these cancer stem cells from the patient's blood might also be used to find the drug combination that is most effective in the individual case. 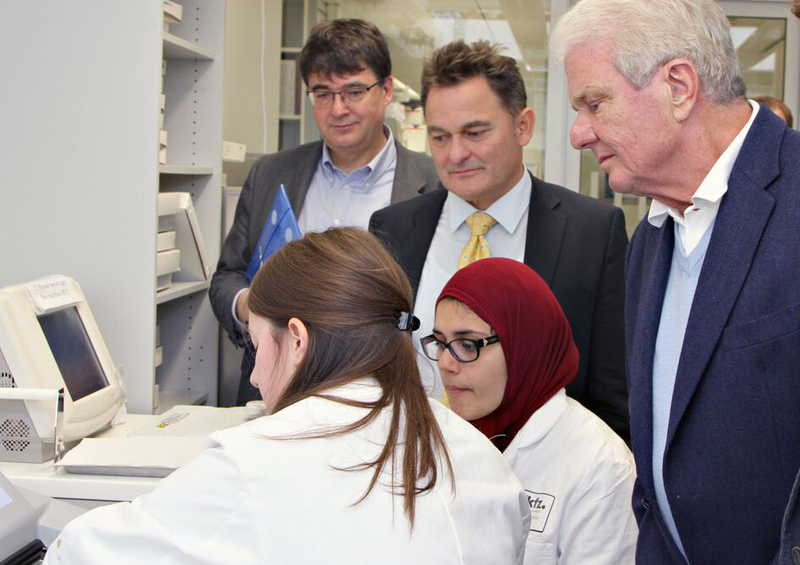 The Dietmar Hopp Foundation contributes €1 million to this project with the goal of advancing these technologies to applicability in patients as soon as possible in collaboration with the National Center for Tumor Diseases (NCT) Heidelberg. In pancreatic cancer, which can hardly be treated successfully to date, HI-STEM researchers led by Martin Sprick discovered how the cancer cells can become resistant to anticancer drugs: An enzyme that is normally active in the liver breaking down toxic compounds is produced in large quantities in pancreatic cancer cells, rendering various anticancer drugs ineffective. By experimentally blocking this enzyme, the HI-STEM researchers succeeded in making the cancer cells sensitive to therapy again. In the upcoming period, the scientists plan to develop a specific agent that can be used to turn off the enzyme that is responsible for resistance. This project will be supported by the Dietmar Hopp Foundation with funds of €1.25 million. "We are very grateful to the Dietmar Hopp Foundation, particularly to its founder, Dietmar Hopp, for the long years of their support and trust in our work," Trumpp said. "We want to use the next years to build on our achievements and transfer our medically relevant findings into clinical trials in collaboration with our partners from the NCT. Our long-term goal is to develop new therapy approaches, break the resistance of cancer cells to drugs and find better ways of treating metastasis. At the same time, we also continuously address new future topics related to normal and malignant stem cells," Trumpp sums up HI-STEM's concept for the upcoming five-year period. Picture Caption: Dietmar Hopp (right) visiting the HI-STEM labs. Hopp is accompanied by DKFZ Director Michael Baumann (left) and by HI-STEM-Director Andreas Trumpp (center). Use is free of charge. The German Cancer Research Center (Deutsches Krebsforschungszentrum, DKFZ) permits one-time use in the context of reporting about the topic covered in the press release. Images have to be cited as follows: "Jutta Jung/DKFZ".